View basket “Activ-Ox Spa & Tank Disinfectant 2000ppm Chlorine Dioxide Solution” has been added to your basket. Watch the demonstration video and case study below to see it in action. 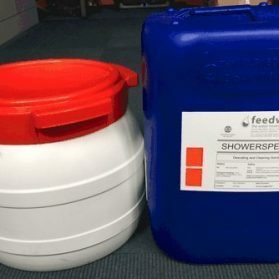 Feedwater is the manufacturer and supplier of Activ-Ox® chlorine dioxide dosing systems and chemicals which are inexpensive, safe and easy to use. The Activ-Ox range treat anywhere from 0 to over 5000m3 per day ensuring there is no application too small or too large. Chlorine Dioxide (ClO2) is becoming increasingly used for water purification because of its unique combination of properties: a powerful, yet selective oxidant and biocide, disinfectant and sanitiser. Read on to find out the many benefits of Chlorine Dioxide Water Treatment and why Activ-Ox is much better than stabilised chlorine dioxide solutions and tablets. For a look at Activ-Ox in operation watch the Dairy case study video, this is a large application using 2 Activ-Ox 4000 units to treat water coming from multiple sources for reuse on site. Our original demonstration video is also available on this page to show how Activ-Ox works using the entry level 2000 dosing system. Why is Chlorine Dioxide so good? 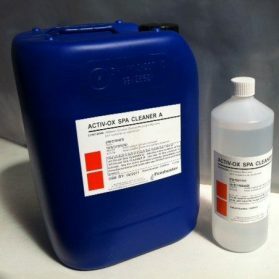 Chlorine Dioxide has been called the ideal biocide because of its unique combination of properties. Potency – It is extremely effective at low dosages. Maintaining a continuous free residual of just 0.1 – 0.5 mg/l of ClO2 in a water supply has been shown to be effective in controlling a wide range of harmful bacteria and problematic microbes. Rapid kill – Chlorine dioxide disinfects and sanitises in seconds, where other microbiocides can take many hours or even days to work. Not pH sensitive – Unlike chlorine and bromine, which both become less effective as the pH of water rises, ClO2 remains an extremely effective biocide between pH 4 and 10. Effective biocide against biofilms – Because chlorine dioxide is a readily soluble gas which dissolves in water without forming ionic species, it is able to permeate and penetrate biofilms which are often relatively resistant to other disinfectants and biocides, such as chlorine. 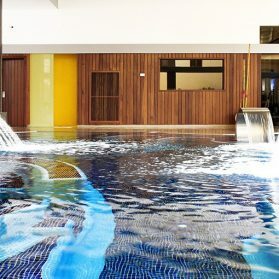 This makes ClO2 particularly effective in controlling and removing pseudomonas and other slime-forming bacteria which can cause major problems in systems such as cooling towers, heat exchangers, spa pools/baths and hot tubs. No Halogenated Disinfection By-Products (DBPs) -When chlorine dosing systems are used in the purification of drinking water that contains natural organic compounds such as humic and fulvic acids, it tends to form halogenated disinfection by-products such as tri-halo-methanes (THMs). Drinking water containing such DBPs has been shown to increase the risk of cancer. ClO2 works differently to chlorine; its action is one of pure oxidation rather than halogenation, so these halogenated DBPs are not formed. High Selectivity – Whilst Chlorine Dioxide is an extremely powerful oxidant, it has a lower reduction potential than most other commonly used oxidising biocides and disinfectants. This lower redox potential means that it is able to kill the microbes without reacting with other contaminants, often resulting in much lower dosage rates which can make it the cheaper alternative. No Taste, Odour and Taint Problems – Ordinary chlorine reacts with ammonium compounds to form environmentally damaging chloramines, which give the water an unpleasant taste and odour. 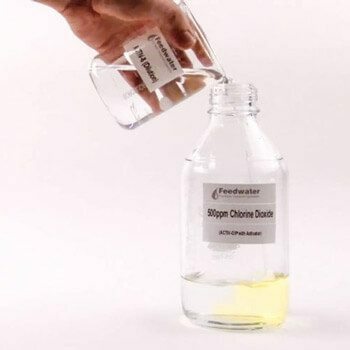 Because chlorine dioxide doesn’t form chloramines and other halogenated DBPs, it does not cause taste and odour problems in drinking water, and in process water there is less risk of tainted product. This means ClO2 is often used in drinking water purification and is the disinfectant and sanitiser of choice for water used in food and beverage production. Watch the demonstration video to explore the Activ-Ox® process in below. 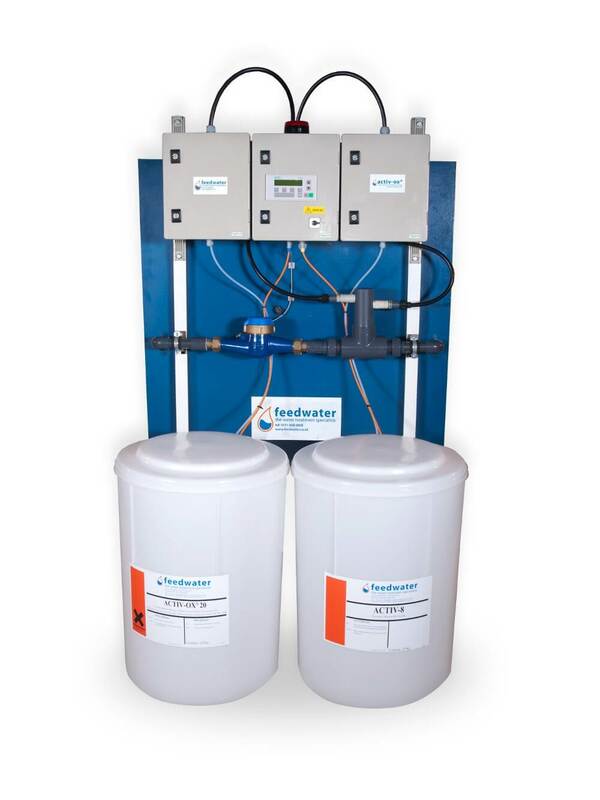 Traditional ClO2 generators and stabilised chlorine dioxide dosing systems are being used increasingly widely. However, the chemicals they use can be hazardous and the generator systems either complex and expensive or cheap and poorly manufactured – often sold by suppliers who just don’t understand chlorine dioxide. This means that many of these systems are not suitable for the applications for which they are supplied. Activ-Ox® is Feedwater’s patented Chlorine Dioxide generation system. 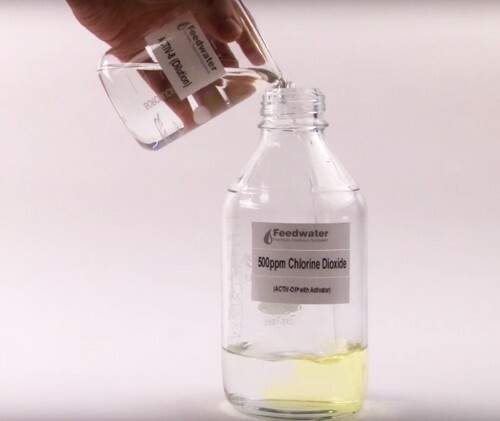 It is simpler, safer and much more effective than other ways of producing ClO2, such as stabilised chlorine dioxide dosage solutions and chlorine dioxide tablets. It is equally suitable for building services, food and beverage and industrial applications. 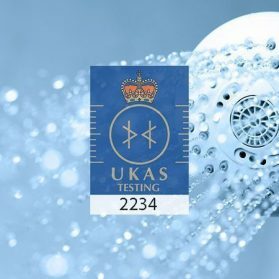 It can be used to treat anywhere from a few litres to 1,000s m3 of water per day and has also been incorporated into a unique chlorine dioxide foam cleaning process for surface disinfection and sanitisation. At the heart of the Activ-Ox system is our patented chemistry which enables us to produce a very high yield of chlorine dioxide (95%+), instantly using low hazard chemicals. The simple, safe and cost-effective way to produce ClO2 without strong chemicals using Feedwater’s patented industry leading chemistry. Check out the demonstration video to see how Activ-Ox is different. What applications can the Activ-Ox® Chlorine Dioxide Treatment System be used for? Think Activ-Ox is for you? Use the Contact Us tab above to discuss your requirements. 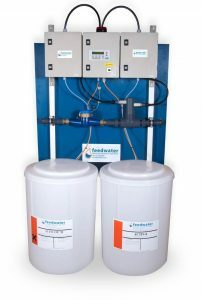 Consider a Chlorine Dioxide dosing system for your Legionella treatment, Feedwater’s patented Activ-Ox system is safe simple and highly effective for disinfecting water systems from all manner of bugs and bacteria. 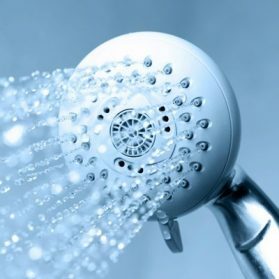 Chlorine dioxide does not produce any carcinogenic byproducts like chlorine when used in the purification of drinking water that contains natural organic compounds such as humic and fulvic acids, chlorine tends to form halogenated disinfection by-products such as tri-halo-methanes (THMs). Drinking water containing such disinfection by-products has been shown to increase the risk of cancer. 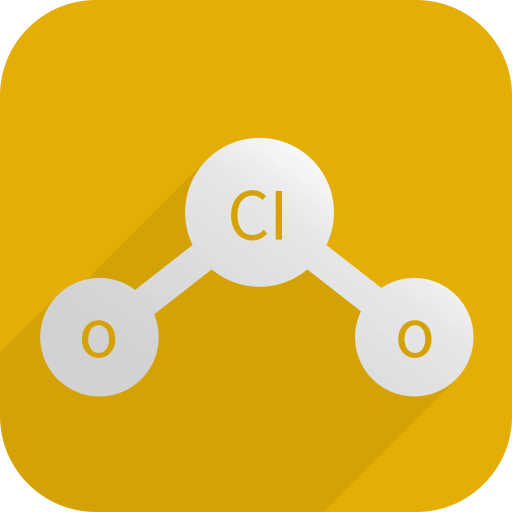 ClO2 works differently to chlorine; its action is one of pure oxidation rather than halogenation, so these halogenated by-products are not formed. To find out more about Legionella Control visit our page here. Feedwater also offers training for legionella awareness including online training and our in-house UKAS accredited laboratory processes thousands of Legionella samples every year and gives advice on remedial action. I n the same way that fresh food is perishable, water quality can quickly deteriorate in storage, resulting in an increased risk to health. For over 30 years, Feedwater has been helping our customers to store and use water safely. We provide a comprehensive range of products and services to monitor and maintain water hygiene in industrial, food processing and building services applications. Our support services team clean water storage tanks daily across the UK for customers big and small to ensure their domestic water systems are kept clear from fouling such as biofilm and debris which can harbour harmful bacteria such as Legionella which can proliferate and colonise water systems causing risk to people. 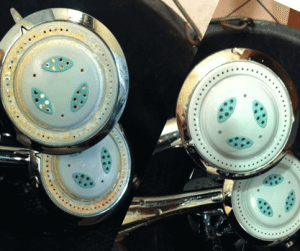 For hard water areas especially Shower head descale and cleaning is an important service offered by Feedwater to remove the scale based breeding grounds that inhabit unmaintained shower head. If you aren’t sure about which services you require and don’t have a Legionella risk assessment in place for guidance and a schedule please speak to us today to ensure you are compliant with the current HSE L8 ACoP. 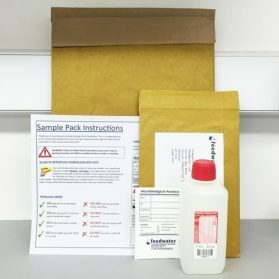 We recommend you use one sample bottle for each sample point. Do not mix samples from more than one tap into the same bottle as this can dilute a positive result and gives no indication of the affected outlet. We are the ONLY chlorine dioxide supplier who offers this unique and highly effective product. We have over 40 years of manufacturing experience, and we manufacture a range of high performance, low cost dosing systems which are much simpler and safer than conventional ClO2 generators.